GROW MUSIC PROJECT could not support our artists without the help of an extremely talented community that believes in paying it forward as much as we do, and backs it up with their time and dedication. Visit our GMP Community Page HERE to learn about the great team of people and partners that contribute to making GMP happen! New: The GMP ADVISORY BOARD PROFILE. Go HERE to learn about the great people involved with the Grow Music Project. New: GMP ARTIST PAGES. Go HERE to learn about the artists and bands in the Grow Music Project. GMP • SESSION DIARIES EP.#5 DEBUTS ON JULY 1! GET READY! 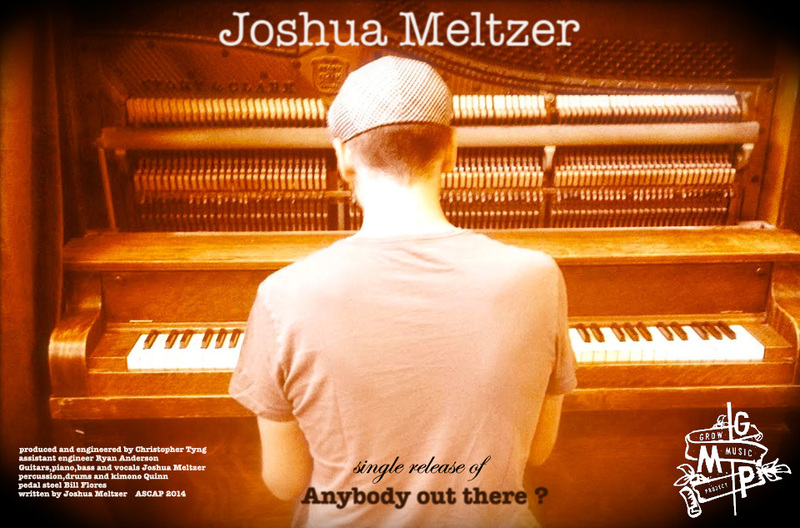 GMP is set to release EP.#5 featuring Joshua Meltzer this coming Tuesday July 1! Come visit the Grow Music Project website or YouTube channel then to see what went into recording Meltzer’s track Anybody Out There. GMP • SESSION DIARIES EP.#4 DEBUTS ON MAY 6! GMP’s Joey Hendrickson Featured on Examiner.com! Yet another great Examiner.com article featuring GMP’s Joey Hendrickson! In short, Joey blew our minds with his natural skills as a singer/songwriter and his ability to create meaningful music endeavors like Columbus Songwriters Association. If you missed the release of his song “Astral Planes” and/or didn’t catch GMP • SESSION DIARIES EP.#2 that went along with it, you can navigate to his GMP Artist page HERE to get caught up. Again, HUGE thank you to Elise Yablon from Examiner for putting this great piece together. Find the link to the Examiner.com article HERE. Big Congrats to GMP friend and participant Tom Harrison on being recognized as having one of the top DIY rock albums of January 2014 by Indie Rock Cafe! The Electric Postcards EP was in fact recorded here at Star Hill Studio and was produced by GMP’s Christopher Tyng. GMP staff member Ryan Andersen also contributed by playing drums on all three tracks alongside bass player Jay Markovitz. What an awesome branch out for the GMP Community! Check out the link HERE to read up on Tom’s EP. Peter Schwinge is the general manager of New Music Seminar, a destination where artists, music reps, and companies are provided with tools, knowledge, and connections necessary to becoming successful in building up the New Music Business. Christopher Tyng is the creative director of The Grow Music Project. He has worked in the music industry as a songwriter, producer, and composer writing music for shows such as “The OC“, “Futurama“, and “Suits“. He has worked with a wide variety of successful bands and artists in Los Angeles spanning across a broad array of genres from reggae to electronica to orchestral. Anina Moore is the Director of Communications with Texas Commission On The Arts, an Austin-based arts agency working to provide resources that reinforce economic development, arts education, and artist sustainability initiatives in Texas and throughout the country. Chris Douridas is a well known radio host on KCRW, Southern California’s leading National Public Radio affiliate, featuring an expansive mix of news, music, and information and cultural programming. Douridas also acts as a major Music Supervisor for TV/Film. For artists and entrepreneurs alike, this is a unique opportunity to hear top industry professionals speak about the idea of having an altruistic approach to the ever-changing music industry. It’s what music should truly be about. To learn more about SXSW and the panel, click HERE. Elise Yablon from Examiner.com put out this great article yesterday recapping Episode 1 of GMP • The Session Diaries. With an average of 37 million unique monthly visitors to Examiner’s homepage, this is amazing exposure for Star and the Sea and the entire GMP Community. Huge thanks again to Elise and everyone at Examiner.com! Find the article HERE. GMP • THE SESSION DIARIES EPISODE #1 – STAR AND THE SEA – PREMIERES FEBRUARY 1! Coming February 1st! The Grow Music Project debuts GMP • The Session Diaries, a documentary series about some of the best new artists you don’t know, but should. GMP • The Session Diaries will bring you into GMP’s Star Hill Studio for a behind-the-scenes look at the artists and their music, and the creative journey that leads to a great song. Our premier episode features Star and the Sea band members Dominique Star, Natalie Weiner, and Matt Gajewski out of New York City. Join us here at www.GrowMusicProject.com on February 1st for the Episode 1 premier, and check out the worldwide debut of the song “Captain and the Map” written by Dominique Star and recorded by Star and the Sea as part of the Grow Music Project! GMP Artist/Band Submissions – REVAMPED and RE-OPEN! Our web-hosting provider updated their web platform, and inadvertently broke our entire submissions system… which caused some problems with artists being able to log in. We’re happy to report that after quite a bit of re-working, everything is back to normal, and should be functioning properly again. Also, we’ve transitioned to a ROLLING BASIS for our artist/band submissions. What does that mean? “Rolling” submissions means that as a suitable candidate is recognized by GMP, they are invited to participate and offered a slot in the upcoming schedule of sessions. We review every submission we receive on a quarterly basis. Go HERE to find out more, or submit an artist for consideration now!